What is Pinterest’s New Following Tab? Have you seen the new Following Tab on Pinterest? In 2018, Pinterest has introduced this new tab, which allows you to see the chronological pins that your favorite content creators pin to Pinterest. In this post, I’m sharing the details of the Following Tab and how you can get more followers to engage with your pins! Even with all of the new changes on Pinterest, it’s hard to miss the new Following Tab! I’m so excited that we now have a place to follow our favorite content creators and see their freshest pins. What is the new Following Tab? The new Following Tab is a separate tab from the smart tab on Pinterest. Find it by clicking on the ‘person’ icon on the top right header of Pinterest. When you click on this tab, you’ll notice that it is very different from the smart tab. It shows some of the accounts you follow on the top of the screen and then when those fresh pins from the people you follow were pinned. You can read more straight from Pinterest about the Following Tab here. It’s very unlikely, based on the priority of all the pins being shared in the Following Tab, that your followers will see every pin that you pin. Pinterest will limit the amount that they show in the Following Tab, so make sure you are always sharing the BEST content that is relevant to your account. Another strategy to benefit from the Following Tab is to use a scheduler like Tailwind (affiliate link!). 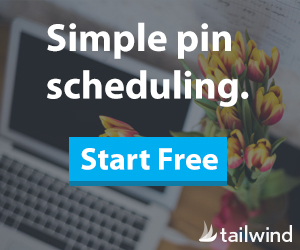 Tailwind is an Instagram and Pinterest scheduler I use every single day to keep a consistent queue of content freshly pinning from my account. Why is this helpful? It ensures that you’ll have content daily going into the Following Tab to maximize clicks and ultimately traffic to your site! Learn more about Tailwind strategies here. So, it’s important to create great new content consistently to communicate to the platform that you are producing content people love! In order to benefit from the Following Tab, make sure to convert to a business account, optimize your profile and images, and use keyword rich pin descriptions! My favorite place to ‘ask’ is my email list! People are joining your email list from all different places; invite them to join you on Pinterest. 3. Create an IG story, and if you are lucky enough to have the ‘swipe up’ feature, lead the IG story to your Pinterest profile page. 4. Include a Pinterest widget or other apps that make it easy to follow you on Pinterest from your website. 5. Include a link to your Pinterest profile on other pages where you frequently create content. 6. Make sure your profile is optimized with keywords so that Pinterest knows what type of content you create! Want to hear from me more? Follow me on Pinterest and don’t forget to pin it!